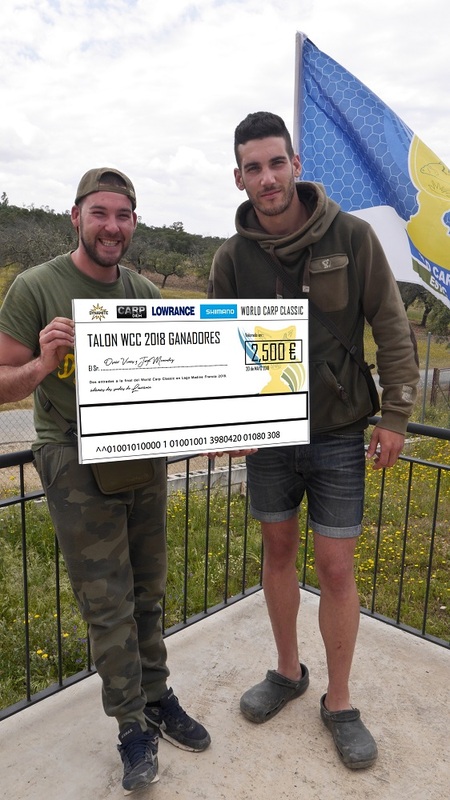 24 pairs of anglers took to the banks of Lake Horno Tejero in Extremadura in Western Spain, to battle it out for a spot in the World Carp Classic final at Lac De Madine in September with several giant carp to over 20kg landed during the two days. 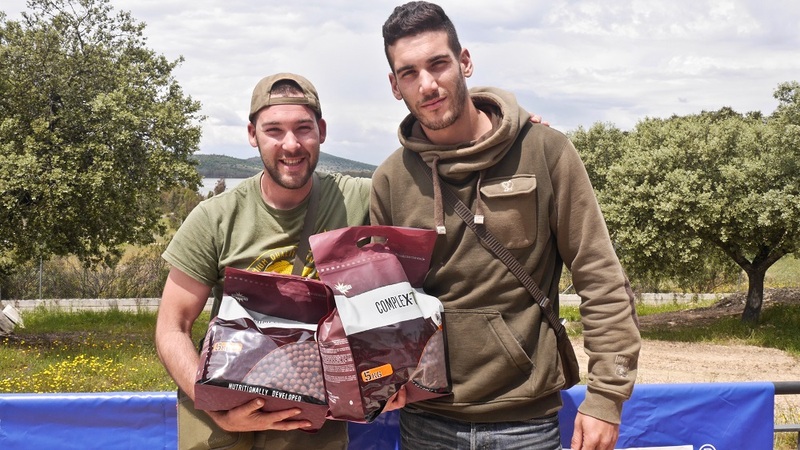 The event, organised by Team Carpdiem Spain – Andy Mcgregor, Angel Bonal and Frank Granados, saw Oscar Viñas and Jorge Serrano Menendez from Madrid take top spot with a whopping 41.1kg of fish from peg 8 using Dynamite Frenzied Tiger Nuts. The pair also banked the biggest fish – a 21.8kg specimen. The weather for this time of the year was incredibly mixed, competitors had just a few hours to get their bivvys setup before a torrential storm swept in. The rain was hard, but it did not dampen spirits as alarms were sounding all around the lake, it was clear the fish were active with many male carp visible to the eye in the margins. 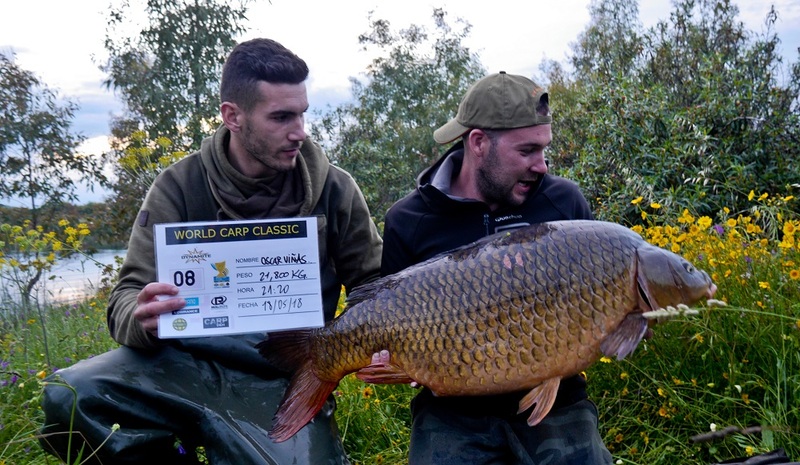 Saul Santos and Sergio Perez, landed four common carp the best three where 7,500, 15,600 16,000 from peg 21. In the same sector in peg 20 team Juan Jose and Jorge Camino also managed to land a stunning 13,000kg common as anglers enjoyed lots of success early on. However, Vinas and Menendez were also catching lots of fish and took the lead after day 1. After the explosive start with 13 fish being caught with an average weight of 15kg, the team from Madrid Oscar Viñas y Jorge Serrano Menendez snatched the final with a total weight of 45,100kg with another solid day 2. Oscar said “ he couldn’t believe it, it´s like a dream, one of the best days of his life”, the pair will goto Lac Madine in France and fish the final in September 2018 with other competitors from around the world. WCC Spain Winners overall Oscar Vinas and Jorge Serrano Menendez from Madrid.